Philadelphia 76ers guard JJ Redick celebrates during the second half against the Detroit Pistons at Little Caesars Arena. There's something special about a pro athlete really wanting to be in the city he plays in. And perhaps for the first time in, well, ages, Philadelphia is flush with Philly-loving stars. The Sixers are ground zero for this, as the formerly unwatchable and despicable Processers have turned themselves into one of the most desirable destinations in the NBA. Before the LeBron James buzz (and later Kawai Leonard and Paul George) picked up steam, sharp-shooting J.J. Redick was an early adapter. The veteran wingman saw the future, jumping aboard a 26-win team just before they broke through and become an Eastern Conference contender. "We far exceeded any expectations that I would have," Redick said Thursday, less than 12 hours after the 76ers fell 114-112 in Game 5 to the Celtics in Boston, "in terms of wins losses, playoff seeding, advancing in the playoffs and most importantly the culture here." It's a culture Redick helped shape by voicing his confidence early, and aiding in the growth of two future superstars. "They are very well equipped [to lead]," Redick said of Joel Embiid and Ben Simmons. "They both had phenomenal years, Ben should be rookie of the year, Joe will make an All-NBA team, you could say both of those guys had very successful years and both have a lot of room to grow. They are the franchise players for the Philadelphia 76ers and they’ll be that for years to come." He signed a very rich $23 million deal last summer, with the assumption that that money would go toward a max free agent like James. It seems apparent that Redick's return would be contingent upon him taking a pay cut. But the desire is undeniably there for the Duke product to return. As he addressed the assembled Sixers' media (or at least the ones who made it just hours after their playoffs ended), he struggled to tip toe around his true intentions and desires. "I don't want to offend any of the other places I have been," Redick said, "or teams I have been on but this was probably my favorite year of my career. Playing in Philly is it's own experience and our fans, the city, the buzz about sports and about this team was amazing." 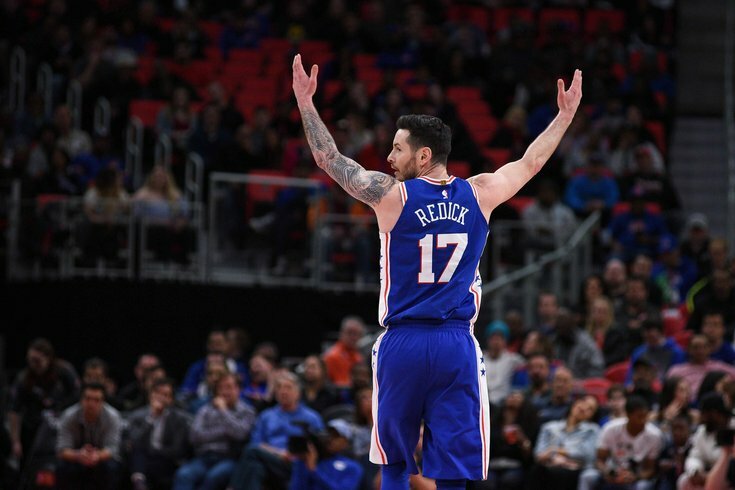 Redick, who averaged career highs in points (17.1 per game) and assists (3 per game), added: "I think there's something to be said for continuity." When will he make his decision and how? Well, he wants to relax and will take six weeks before he sits down and discusses his playing future with his agent and Sixers' GM Bryan Colangelo. But how much will money factor into his thinking? "It’s a mutual appreciation," he said. "I am sure we all hope that but the numbers can get tricky. It's not my job to worry about that. "In terms of financially, that’s always something a free agent has to weigh. You have to weigh contract length, AAV, total value, winning, proximity, you weigh all those things." Redick smiled when he said "proximity." You can bet, if the price is anywhere close to right, Redick will be back in South Philly for 2018-19.